PreOrder your Xbox One X 1TB Console now. 6 teraflops of graphical processing power provides a more immersive gaming experience. Lose yourself in worlds built for true 4K gaming, where action comes to life with 2160p frame buffers and 6 teraflops of graphical processing power. And experience premiere sound that puts you in the center of Spatial Audio. PreOrder your Xbox One X 1TB Console now. 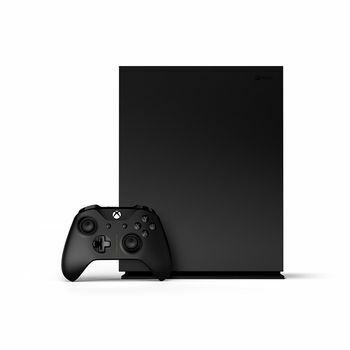 • The world's most powerful console • 4K Blu-ray player for immersive gaming and entertainment • Works with all your Xbox One games and accessories The world's most powerful console Games play better on Xbox One X.1 With 40% more power than any other console, you'll experience truly immersive 4K gaming. Unprecedented performance Xbox One X unleashes 6 teraflops of graphical processing power, making games play better than they ever have. Maximize game performance with the speed of 12GB GDDR5 graphics memory and see every frame with 326 GB/sec memory bandwidth. Feel True Power 6 teraflops of graphical processing power provides a more immersive gaming experience. Lose yourself in worlds built for true 4K gaming, where action comes to life with 2160p frame buffers and 6 teraflops of graphical processing power. And experience premiere sound that puts you in the center of Spatial Audio. Play with the greatest community of gamers on Xbox Live Find friends, rivals, and teammates in the best global gaming community.5 Dedicated Xbox Live servers maximize performance by ensuring stability, speed, and reliability. Compete, connect, and share across platforms with gamers on Xbox One and Windows 10 The biggest blockbusters perform better All games look and play great on Xbox One X. But select Xbox One X Enhanced titles are optimized to take full advantage of the world’s most powerful console Play Original Xbox games on Xbox One X The future of gaming does not forget its past. Play hundreds of Xbox 360 games10 and, coming soon for the first time, classic Original Xbox games on Xbox One X. Experience game franchises across generations and enjoy the titles you own and love at no additional cost. And games on Xbox One X look great even on a 1080p screen.